Blue Adventurer is a part of Blue o Two Fleet. This fleet concentrates on luxury liveaboards. 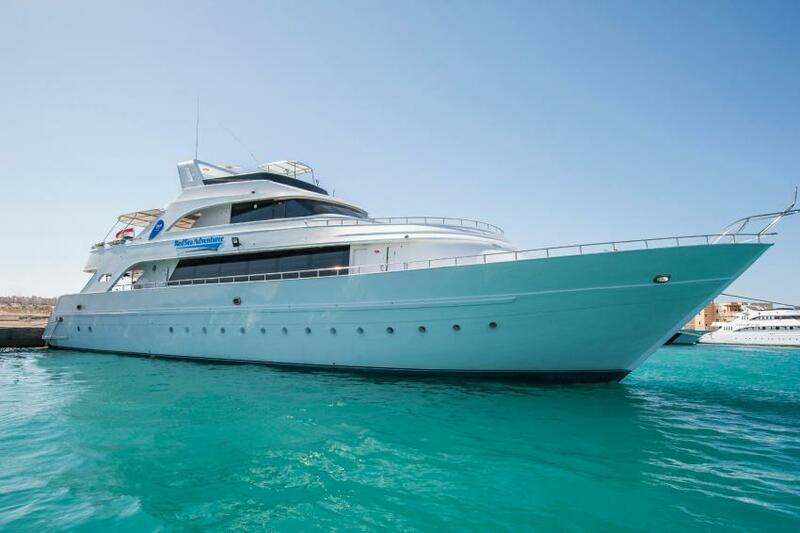 Twenty-two guests can be comfortably accommodated on a board of Blue Adventurer. Her twelve cabins equipped with air-conditioning, private showers and storage systems. Boat's lounge area divided into two parts. Salon with its cozy soft sofas is perfect to spend time in between dives. Another part is a dining area where meals are served. On the Red Sea Adventurer’ sun deck guest can enjoy the amazing view, relax on sun loungers. Dive deck of Blue Adventurer is big, so all divers on board can comfortably prepare for diving and maintain gear after. it has storage boxes and fresh water showers. Boat equipped with a nitrox membrane and also she is a rebreather friendly. Blue Adventurer can offer special facilities for photographers. Safety is always in the first place. Crew team of Blue Adventurer is experienced and knows how to manage emergency situations. Boat equipped with necessary equipment like first aid kit, emergency rafts, and life vests. There is an emergency oxygen on board and firefighting equipment. All the top destination of Red Sea included in the Red Sea Adventurer’ itineraries. North dive sites of Egypt represented by wrecks. Divers will be exploring Thistlegorm, Rosalie Moller, Abu Nuhas. This sunken ship is like a must-see for Egypt. If you are an experienced diver you can penetrate to its cabins and decks. Another attractive route for divers that can offer Red Sea Adventurer is Brothers Islands, Daedalus, and Elphinstone. This destination offers ti dive between reefs and along the walls coated with numerous hard and soft corals. Fish variety attracted to this area will impress you and give an opportunity to make the best photos. On the South of the Red Sea many big pelagics can be seen. Hammerheads are often met while diving on this dive spot. To visit Egyptian diving destination better to choose a time in between April and the middle of the summer. This period can offer the best conditions. In Winter water temperatures can be slightly cold for diving and the end of the Summer is not the best time to try to meet with sharks. Hannah and Luke (the guides) were helpful,knowledgeable and friendly.The crew worked so hard to make our stay so amazing.Hannah and Luke worked very hard as well.